It’s been quite a saga, one that has captured the attention of an entire nation and indeed many people around the world. An establishment figure who, only a year and a half ago, seemed politically invincible now faces what can only be described as a stunning defeat. The path from there to here has been a remarkable one. The movement that helped bring about this moment has drawn its energy from groups who have surprised many observers with the breadth and depth of their political engagement. As this movement steadily grew over the course of 2007, the political climate accordingly intensified, culminating this January and February in an extraordinary campaign and a stunning set of election results. But to the unending frustration of many, here we are in June, and the durability of any meaningful resolution remains somewhat unclear. Back in February, it seemed to many observers that at least the first round of that anti-establishment political campaign had reached a swift conclusion. But then February dragged into March and April, and a series of controversies and arguable missteps followed. Leading members of the Bush administration and their allies started to complicate matters by inserting themselves into the fray. Now that summer has arrived, a common question continues to be on the minds of many: will this drama really end any time soon? The past week has finally raised hope that some sort of resolution is at hand. However, it is still not at all clear that the road ahead will be a smooth one — to the contrary, many signs point to a rather bumpy political ride. For one thing, political figures who owe electoral success to a grassroots movement will now be held accountable to it: the movement that fueled electoral victory will not look kindly upon any sort of compromise or power-sharing arrangement if such a deal jettisons its principles and values. And of course there remains the formidable challenge of dealing with a powerful establishment figure who retains intense support in politically influential quarters. With some erstwhile allies abandoning ship — apparently to the point of insisting upon an earlier departure from the political scene than anticipated — there has been much talk in recent days of the possibility of a “soft landing” or “dignified exit.” The end of this particular political chapter may finally be drawing near. Whatever the fate of Pervez Musharraf himself, there remains the complicated question of how Pakistan’s governing coalition might roll back the legal and institutional changes that Musharraf imposed by decree during last fall’s Emergency. For the past few months, the leadership of the Pakistan People’s Party has been equivocal about its interest in rolling back Musharraf’s Emergency — indeed, to date the new government even continues to retain Musharraf’s Attorney General in that post. Last week, however, it was reported that the PPP had prepared a lengthy draft package of legal changes which includes, among other things, reinstatement of the judges ousted by Musharraf during the Emergency. Based on that draft text, which is incomplete and may still change, a few things are worth noting. Second, the draft package would limit the power of the presidency. The key amendments include a provision repealing Article 58(2)(b), a provision added during the 1980s by General Zia-ul-Haq which confers power upon the president to dissolve Parliament, and a number of provisions transferring specific powers from the president to the prime minister. These provisions would restore the constitutional balance of authority in favor of Parliament over the presidency, as originally contemplated by the Pakistan Constitution of 1973, and will be welcomed in many quarters. Under the PPP’s coalition partner Nawaz Sharif, Parliament actually repealed Article 58(2)(b) during the late 1990s, with support for the repeal coming from across the partisan spectrum. 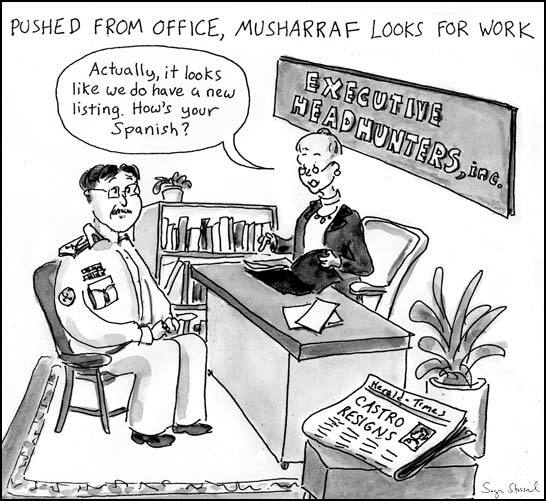 Musharraf, however, restored the provision following his first coup d’etat in 1999. The availability during the 1990s of a means by which the executive could dissolve Parliament facilitated a state of affairs that Husain Haqqani has referred to as “military rule by other means.” Especially over the medium and long-term, it certainly would remain to be seen whether the Army would go along with the elimination of these provisions. Finally, while the draft package would reinstate the judges ousted by Musharraf, it apparently also includes a number of provisions designed to limit judicial independence and to place the judiciary under tighter parliamentary control, most notably by limiting existing judges’ terms of office and making changes to the judicial appointment process. For months, both Musharraf and the Bush administration have been actively maneuvering to prevent Chief Justice Iftikhar Muhammad Chaudhry’s reinstatement, and earlier proposals floated by the PPP leadership reportedly would have excluded Chaudhry from the restoration package altogether. When those proposals met with resistance from the lawyers’ movement, civil society, and Nawaz Sharif, the PPP leadership now instead seeks to limit the chief justice’s term of office. A key issue lurking in the background of the dispute over the judges is the fate of the National Reconciliation Ordinance brokered by the Bush administration between Musharraf and Benazir Bhutto, which purports to indemnify Benazir and her widower, PPP Chairman Asif Zardari, and to dismiss all of the corruption cases pending against them. The legality of the NRO has been challenged, and an independent judiciary with Chaudhry at the helm may or may not validate it. So far, Zardari has largely seemed disinclined to take his chances about that. So far, both the lawyers’ movement and Sharif have been relatively unimpressed by the constitutional package, regarding many of its features as too much of an accommodation with Musharraf, his extraconstitution, and his handpicked judges. Sharif has pulled the ministers from his Pakistan Muslim League (N) party out of the cabinet, although he has not pulled the PML-N out of the coalition altogether. The lawyers’ movement has scheduled a “Long March” to Islamabad for the coming week — and remarkably, over a hundred rank and file PPP members of Parliament have indicated their support for the Long March. Today, Musharraf said that all other things being equal he would prefer not to be a “useless vegetable,” and that if the Parliament’s constitutional package leaves him without “any role to play, then it is better to play golf.” (His spokesperson, however, was quick to note yesterday that Musharraf “has not packed … his golf bag” just yet.) Back in January, after Benazir Bhutto was assassinated, Zardari said that he would groom their 19-year-old son, Bilawal Bhutto Zardari, to take the helm as PPP chairperson, and that when Bilawal is “responsible enough,” then he, too, could leave politics to “go and play golf.” Lame duck President George W. Bush has apparently stopped playing golf, but has by no means stopped expressing strong support for his friend Musharraf. (Recall that Bush famously asserted that Musharraf had not “crossed any lines” during the Emergency.) Maybe Musharraf and Zardari will soon find themselves accusing each other of cheating on the golf course, rather than in politics — with Bush serving as caddy, reviewing the scorecard, and trying to broker a deal between them.